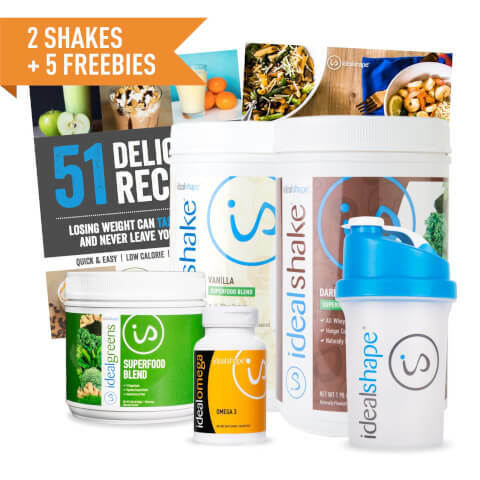 This special Lean & Green Bundle is perfectly designed to supercharge your weight loss while keeping your body fueled and healthy with our delicious IdealShake Super in both Vanilla and Dark Chocolate flavors (naturally sweetened & flavored with Stevia), IdealGreens, our super greens and super food blend created to kickstart your nutrition, and a bottle of IdealOmega, our popular omega-3 fatty acid supplement made to support your heart and joint health. Minimize discomfort from bloating or gas. Detox and alkalize the body. IdealPlan Nutrition Guide eBook - Your Complete Fat Loss Meal Plan! Weight loss has never tasted so delicious! With this tasty Smoothie Recipe eBook, you'll get 51 mouth-watering recipes made with our hunger-blocking IdealShake, so you can treat your taste buds and slimdown at the same time. From sweet to savory, the Smoothie Recipe eBook has a variety of yummy meals to satisfy your cravings and jumpstart your weight loss goals. I ordered a few years ago . and loved this product . The shakes have a great taste and the plan is easy to follow. I ordered again today . I plan to continue using this product. I absolutely love this bundle and it tastes great! Amazing products. The shakes are delicious and the best part is they dont leave you feeling hungry. i would highly recommend these products.